FCCU has launched EMV (chip) technology for our credit and debit cards, which increases security and decreases fraud resulting from counterfeit, lost and stolen cards. 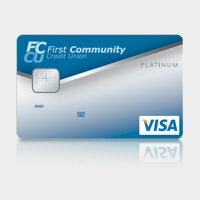 This "smart card" has a microchip embedded in the card that is encrypted, providing stronger security. Unlike a magnetic stripe card, it is virtually impossible to create a counterfeit EMV card that can be used to conduct an EMV payment transaction successfully. The process of using the card is different than the old magnetic stripe card. If the terminal is not chip card-enabled, the transaction will be processed the same as today's environment with the magnetic stripe. If the terminal is chip card-enabled, the terminal will read the magnetic stripe and recognize it as a chip card. The message on the terminal screen will read, "Please insert the chip card into the terminal." If prompted by the terminal, insert your card. Authenticating every user prevents someone else from using it. Terminals may use different formats to authenticate the card user. There are two methods that can be used to authenticate the cardholder. Those two methods are PIN and signature. A PIN is one method to verify the cardholder is the person doing the transaction. A signature is another method. After receiving transaction receipt and before leaving, remember to remove card. Some terminals will beep as a reminder, but others won't. EMV is an acronym for its developers â€“ Europay, MasterCard, Visa and is the chip technology that is prominent in Europe and other parts of the world. Chip technology is already prevalent outside the United States and financial institutions are preparing for a migration of chip readers at merchants domestically.